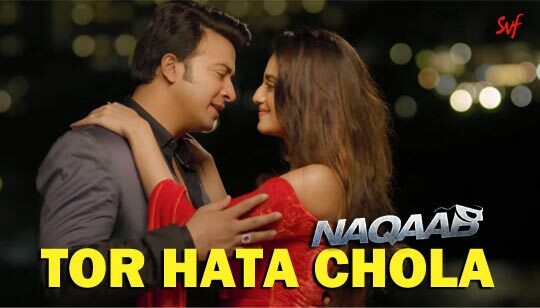 Tor Hata Chola Lyrics from Naqaab bengali Movie: The song is sung by Armaan Malik and Prashmita Paul Starring: Shakib Khan And Nusrat Jahan Music composed by Dev Sen And Tor Hata Chola Bangla Song Lyrics written by Prasen. Movie Directed by Rajiv Kumar. পাতা গেছে ভিজে, কি যে করি রে ? Pata Geche Bhije Ki Je Kori re? News about Tor Hata Chola Lyrics : Great news for all "Armaan Malik" lovers, He is come with his new and fresh Bengali song The lover boy Shakib Khan And gorgeous Nusrat Jahan, Sayantika Banerjee, Rudranil Ghosh, Sudip Mukherjee is the starring In This Movie. Edited by Mohammad Kalam Art Direction: Ananda Adya Choreographer: Arabinda Thakur & Script: N.K. Salil.